It was meant to be a routine visit, but yesterday’s oversight duty by senators at the Customs headquarters turned out to be more. 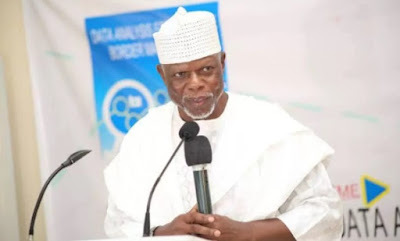 It sparked another confrontation between them and Comptroller General (CG) Colonel Hameed Ali (retd.). The Senate and Col. Ali had a long row over his refusal to appear before the upper chamber in uniform. The drama yesterday was triggered by remarks made by the Chairman ad- hoc committee on “Economic Waste in the Nigerian Customs Service”, Senator Dino Melaye, over the manner in which the Senate delegation was received at the Customs Abuja headquarters. Melaye noted that Col. Ali, by way of protocol, should have come down from his office to welcome the committee members into the premises. The Kogi West lawmaker said it was a breach of protocol for the CG to casually meet the delegation at the conference room. Melaye noted that ushering in the senators had been the practice with statutory bodies, such as Immigration, Prisons and others, over the years. He wondered why such established etiquette, which he said was the norm under previous Customs CGs was not accorded the committee by Col. Ali. Melaye said, “Before reading the prepared speech of the committee, let me make this small remark on what we have just observed here in form of breach of protocols. “Mr CG, rather than meeting us here at the conference room by way of courtesy, you are supposed to have met us at the ground floor on arrival into the premises. “That has been the practice of statutory bodies headed by Chief Executive Officers like you. Relevant Senate committees have over the years been accorded this by bosses of Immigration Service, Prison Service and others, making us to wonder why it is not so here today under your leadership. Melaye insisted that the committee’s meeting with the Customs management was more or less that of the Senate. Apparently to indicate that the Senate was sitting, Melaye hit the gavel on the table to declare the meeting open. He read a speech to outline how the committee would carry out its investigation on the alleged economic waste in the Customs Service. In a counter attack, the Customs CG told the Senate delegation that the NCS has its own protocol, which is different from other public establishments. Col. Ali told the committee that the NCS would not want to be dictated to on matters of etiquette and protocol. He said: “We have our own protocol as regards receiving visitors like you. I don’t need to come downstairs to receive you just as nobody in the Senate or House of Representatives has ever come out to receive us anytime we visit the National Assembly. “In fact, by way of etiquette, it is the committee that is supposed to come to my office first on arrival and not just come straight to the conference room. “Let me state clearly that we in the Nigeria Customs Service are servants of the people. We believe in Nigeria and working with others to make it great without being railroaded in anyway. “Personally, I took this job because of my commitment to serve this country selflessly, having earlier done so in the military. So, nobody can tell me that I’m not a committed Nigerian. The Senate committee, which appeared not to be satisfied with Col. Ali’s reply, boycotted a group photograph organised by the Customs. As the visitors got set to leave the premises, they found that the Customs boss’ convoy was obstructing them – an action which they thought was deliberate. There was no official comment on this last night. While the Customs boss left the headquarters at about 2:15pm with his siren blaring convoy, the senators team left around 2:20pm after staying in their bus for about 15 minutes. Besides, Melaye, other senators in the delegation are: Samuel Anyanwu (Imo East), Gilbert Nnaji (Enugu East), Hamman Isah Misau ( Bauchi Central) and Babajide Omoworare ( Osun East).